The membrane bound glycoprotein mesothelin (MSLN) is a highly specific tumor marker, which is currently exploited as target for drugs. There are only limited data available on MSLN expression by human tumors. Therefore we determined overexpression of MSLN across different tumor types with Functional Genomic mRNA (FGM) profiling of a large cancer database. Results were compared with data in articles reporting immunohistochemical (IHC) MSLN tumor expression. FGM profiling is a technique that allows prediction of biologically relevant overexpression of proteins from a robust data set of mRNA microarrays. 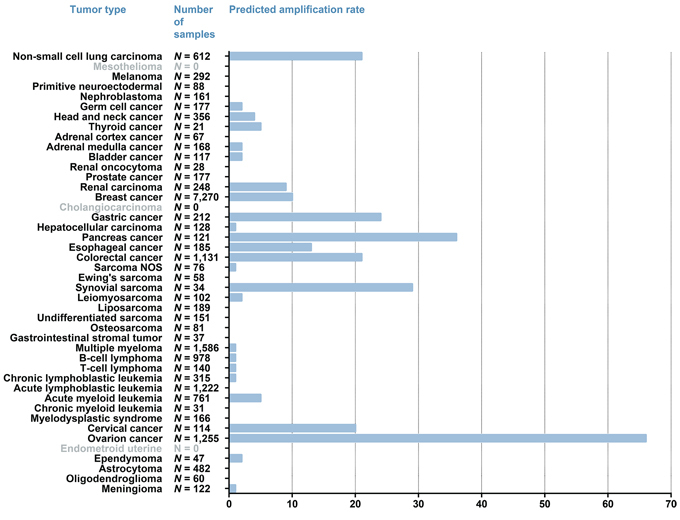 This technique was used in a database comprising 19,746 tumors to identify for 41 tumor types the percentage of samples with an overexpression of MSLN compared to a normal background. A literature search was performed to compare the FGM profiling data with studies reporting IHC MSLN tumor expression. FGM profiling showed MSLN overexpression in gastrointestinal (12–36%) and gynecological tumors (20–66%), non-small cell lung cancer (21%) and synovial sarcomas (30%). The overexpression found in thyroid cancers (5%) and renal cell cancers (10%) was not yet reported with IHC analyses. We observed that MSLN amplification rate within esophageal cancer depends on the histotype (31% for adenocarcinomas versus 3% for squamous-cell carcinomas). Subset analysis in breast cancer showed MSLN amplification rates of 28% in triple-negative breast cancer (TNBC) and 33% in basal-like breast cancer. Further subtype analysis of TNBCs showed the highest amplification rate (42%) in the basal-like 1 subtype and the lowest amplification rate (9%) in the luminal androgen receptor subtype. July 6, 2015 in Publications. ← GWAS for executive function and processing speed suggests involvement of the CADM2 gene.